The market was soft on open this morning giving back all the gains and them some implied by the SPI Futures on Friday (+20pts), however buyers stepped up to the plate largely focussing on the banking stocks ahead of the Hayne RC report which is just out – my initial thoughts after a quick scan below. Obviously most focus on the RC today, however eco data out this morning was also soft…Building Approvals -8.4% versus 2% expected which took the wind out of the sales of the AUD. The ASX 200 closed up +28points or 0.48% to 5891. Dow Futures are currently trading up +8pts. In 76 recommendations, Hayne recommends tougher regulation, more scrutiny of pay and culture and pushes the securities regulator to consider court action as a first option. But stops short of calling for them to be forcibly broken up to stop them offering financial advice and wealth management. Basically, vertical integration stays which is a win for AMP and IOOF plus Westpac as the bank that has kept their wealth business (all else have sold). The root cause of much of the industry’s wrongdoing is pay and bonus structures, Hayne said. The prudential regulator APRA will be tasked with stepping up supervision of remuneration, and banks should review their pay systems for frontline staff at least once a year. Mortgage brokers to be paid by the borrowers, not the banks. That’s tough for the brokers but good for the banks with big domestic footprints – best for WBC and CBA + also good for comparison sites I would think. Reporting; No stocks out with reports today – BLD downgraded we start to get a few out tomorrow. CBA on Wednesday a big one. 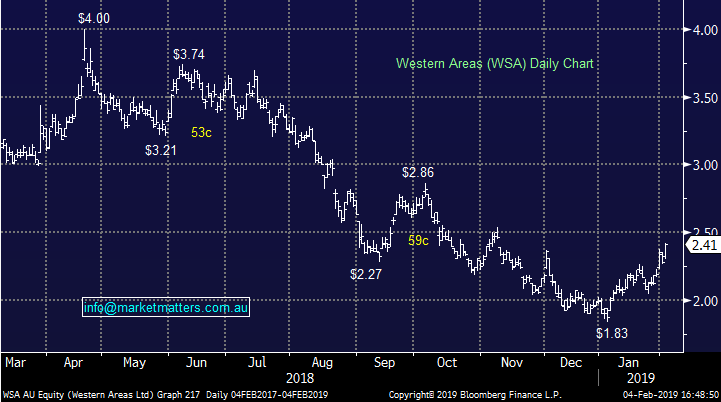 Western Areas (ASX:WSA) +5.7%; One of the resource stocks that recently plumbed new 52 week lows and is now starting to see some strong buying. 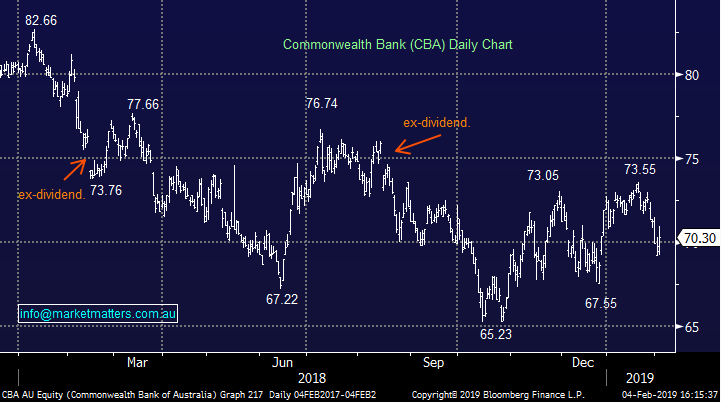 Looking at resources more generally, the Australian miners (XJR) have added a whopping ~17% (USD terms) since 20 December when the index plumbed a 15 month low. This was at the tail-end of a tumultuous year (XJR down ~11%) whipped around by Trump-Trade –Tariffs with most of the downdraft in the final quarter. 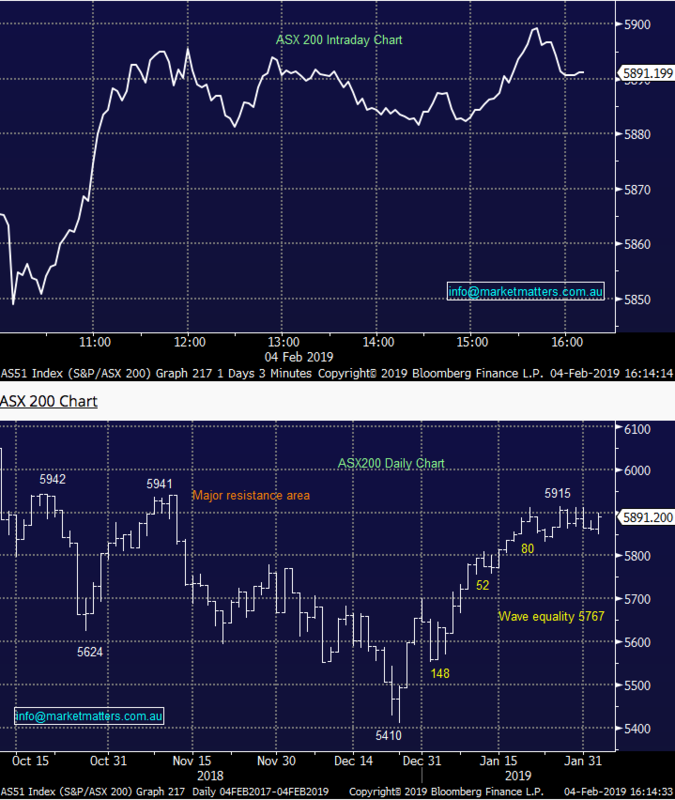 We like WSA, targeting higher prices but remember, resources are very cyclical. 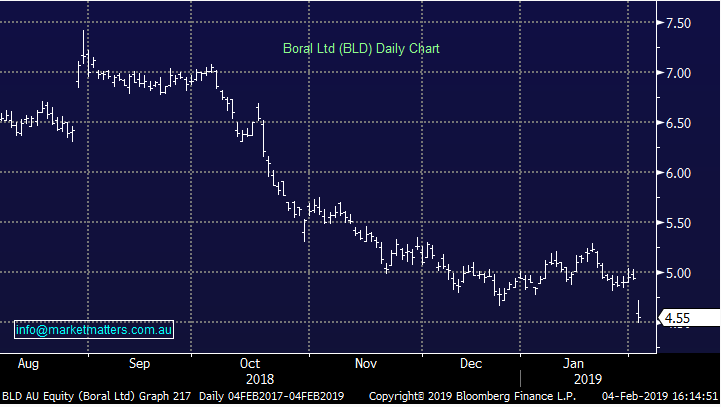 Boral (ASX: BLD) -7.89%; Despite record levels of infrastructure spend locally and in the US, Boral today lowered guidance heading into the first half result. The building materials company is now expecting little to no growth in EBITDA in the first half of FY19, while guiding to NPAT of around $200m. Commentary for the full year result also turned a little sour with Australian operations seen flat for the year down from previous guidance of low single digit growth, North American operations to see 15% growth at the EBITDA line which is down from 20% growth at previous guidance, and profits from the USG Boral joint venture now expected to be slightly lower in FY19, down from profit growth of around 10%. Also concerning investors is further warnings around a strong second half skew to the result, with Boral pointing to volume lags, project delays and extreme weather in the first half holding back earnings despite strong underlying market conditions. Boral will report their first half result on February 25.